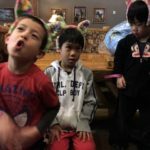 In late March 2016 during spring break, the New West EV Family made the trek south of Olympia, WA to the Great Wolf Lodge all the way from New Westminster, BC. 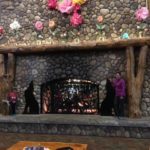 Great Wolf Lodge is a hot and humid indoor water-park and thematic hotel in the middle of no-where Washington state. 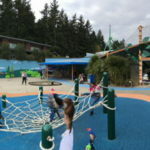 There are a dozen or more of these monstrosities across the US and this one is perfectly situated, equidistant from Seattle and Portland, for frazzled parents to whisk away their kiddos for some distraction in the middle of the gloomy winters. For us Canadians it was a welcome escape from our cool, damp, and grey winters. 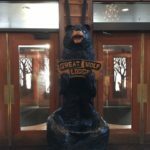 We had really wanted to get someplace like Palm Springs or San Diego for some authentic sunshine but since our loonies and toonies don’t go as far these days the artificial tropics of the Great Wolf Lodge was just what we needed and what the pocket book would accept. 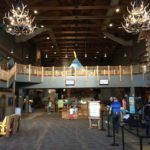 We drove our 2013 Nissan Leaf to the Lodge and the purpose of this blog entry is to convey real life experiences of taking longer distance trips in this primarily city vehicle. We have grown to love our Leaf – nearly everything about it, but just like nearly every other Leaf owner our chief request is for more range please! The second take away is that public charging needs to be more prevalent and more reliable. Anyway, on with the blog. Evening trip to Centrallia for a DCQC top-up. Run all the way home leaving Great Wolf about 3 pm or so. Burlington – Magic; 67 km; used 60% (planned 75%); Charged to 82% – unfortunately had to wait for a customers 2016 30 kWh Leaf around 25 minutes but had a nice discussion with the Leaf sales person. 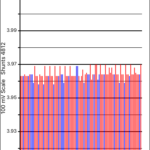 The 30 kWh Leaf really holds the DCQC charge rate much longer than the 24 kWh Leaf. Magic – Torklift apx. 66 km; used 50%; L2 charge from 32% to 38% while waiting and loading on the trailer hitch as (heavy) cargo. Torklift to Zoo; 41.3 km; used 26%, arrived with 12% remaining. Estimating my Leaf’s capacity is ~19.7 KwH at the time of the trip each percentage is 0.197 kWh so this leg used 7.2 km/kWh (calc’d) – a bit of a nail biter but traffic slowed nearer the zoo as it was in the tourist area of Tacoma, WA. By God’s grace in the otherwise full parking lot of the zoo there was a stall open right beside the single Chargepoint that was in use by a Tesla. The Tesla‘s charge door LED was not lit and not flashing so I assumed this to mean it wasn’t doing anything (which I later learn’t doesn’t necessarily mean this). I wrote a note apologizing and and indicating our situation and we had a low state of charge. 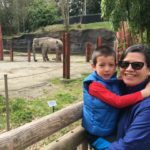 So I unplugged the Tesla and we visited the zoo (it was late in the day and appeared the Tesla was full and had not moved.) I left the Tesla’s J1772 adapter and charge door open figuring the less I touch the better. 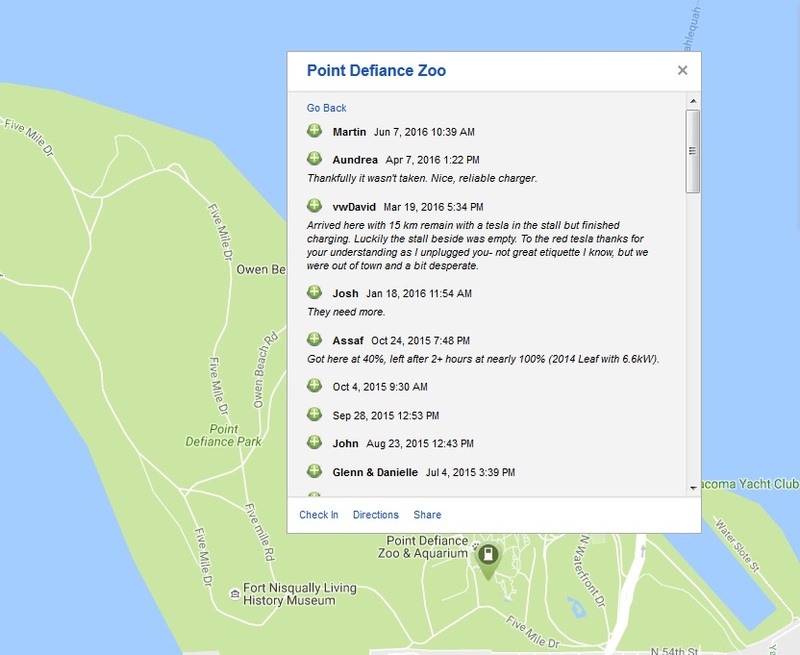 I was a bit nervous about it expecting a page over the zoo’s intercom “would the owner of the grey Leaf please come to the parking lot for a beat down!” Nothing happened, not even a note from the Tesla driver which had departed before we did. Typically unplugging another EV while charging is exceedingly bad manners; admittedly if its a Tesla I don’t worry about it as much. We later easily found our way to a Best Western Hotel nearby with L2 and Tesla EVSE’s and gained 100% charge before the evening was through. 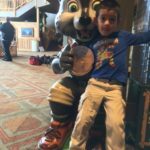 The next day we departed with a 100% charge and with 95 km to Great Wolf Lodge we had time to kill. 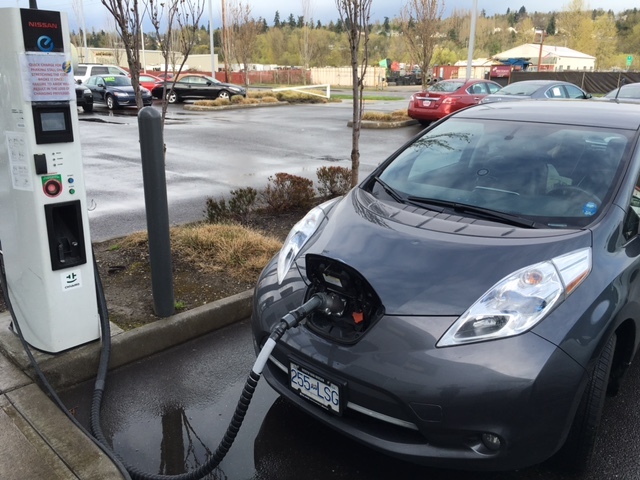 We did some shopping nearby and hit the Tumwater DCQC for a quick top-up charge. If the Lodge had an EVSE we would have skipped this DCQC and the DCQC this evening. Even if the Lodge had 110v outlets available we could have skipped it. HEY WORLD of HOTELIERS! 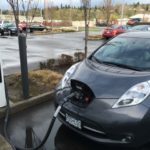 – get EVSE and accessible outlets for EV’s. Tumwater to GWL 25.2 km; used 25%. There was no charging opportunity at GWL at all. I had e-mailed the reservation desk prior to my visit. I e-mailed central reservations and my e-mail got forwarded to local maintenance. I never heard back specifically at all about this request despite repeated requests. I hunted around for an exterior 110 v socket and there were none on this enormous property, what a pity. There were a number of Tesla’s parked in the lot and a high-profile destination like this could certainly accommodate a handful of L2 chargers. Later in the evening I traveled 15 km each way to the Centrallia for groceries and DCQC for a top-up to 90% before arriving back at the lodge with 82%. Noah and his friends wolfing it up. 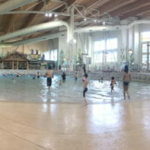 Wave pool at Great Wolf Lodge. This photo is panoramic and shows about 1/3 of the indoor waterpark. A note on lithium battery temperature. DC quick charging adds energy quickly and in doing so increases the battery temperature due to internal resistance of the battery. 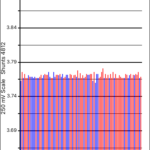 The Nissan Leaf’s Achilles Heal is that the battery is not temperature controlled and therefore long duration’s (think weeks/months/years) at high temperatures significantly degrade the battery capacity. During day 3 we DC quick charged five times, but they were not full complete charges. The starting temperature was around 15 *C and the battery temperature after the final DCQC of the day was 40 *C. When we arrived home the temperature was already cooled to 37 *C while driving. DCQC at Younker Nissan Renton, WA. No Charge! All in all the trip was great but quick charging every 50-75 km is not perfect. The spacing of the DCQC are not perfect. 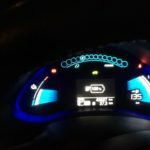 Perfect (for a Leaf with minimal degradation) would be 110 km leaving a 20 km buffer and would make the trip a bit more efficient- but this will never happen as the factors for locating DCQC installation sites have a long list of other parameters to consider- not to mention profiles of other vehicles or vehicles with degraded batteries. This got me interested in the 2016 Leaf with the 30 kWh battery option. This would provide a range of 172 km or so and significantly reduce the number of stops for DCQC on a trip like this. We would likely have been able to, at a minimum, skip every other DCQC with the 30 kWh battery providing a solid 140-150 km range with some back up. In counting the costs, we did better on this trip. I didn’t have to make any long distance phone calls to DCQC service providers and I didn’t have to use roaming data on my iPhone. I also got a free DCQC charge at Magic and Younker Nissan. I paid $20 USD for a month of unlimited usage with AV Networks. I used an AV charger 7 times. I used a Blink DCQC and Blink level 2 twice using guest codes for a total cost of around $10. All in all I paid around $35 for charging and we covered around 800 km. That’s around 4.4 cents per km. If AV had DCQC’s throughout the Seattle core we could have reduced this further. Looking forward to this summer, we routinely travel to Osoyoos, BC. The #1 and Crowsnest #3 Highway’s have recently been electrified with DC Quick Chargers in Abbotsford, Chilliwack, Hope, Manning Park, Princeton, and Keremeos. The entire trip is 387 km one way to Osoyoos, BC and we would need to stop at each DCQC except Chilliwack. Frequent charging is required despite the short driving legs because of the elevation gains in the mountainous driving. The overall elevation gain of the trip is nearly 6000 m and while most of that is given back eventually we would have to stop frequently to ensure we can make it over the mountain passes. A 30 kWh battery here to would go very far in making the Leaf much more reasonable for a journey like this. 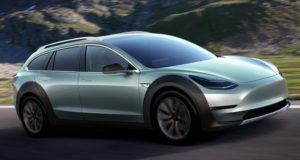 I am really excited for longer range EVs with 200 km range and more. While there is much public desire for 200 mile EVs (320 km), I think that around 240 km of range would be plenty for us and make our summer trips to Osoyoos easy with one or two DCQC stops of about 20-30 minutes. During the rest of the year we rarely need the additional range and certainly don’t need 320 km in the city. I think my perfect compromise would be a 36-40 kWh battery in the Leaf. We also need a bit more space. I think my perfect vehicle would be an Audi A6 Avant Allroad s-line with Tesla drive train. One can wish can’t they? The more I contemplate the more the Tesla Model X grows on me- I initially really disliked the styling of the Model X, but now I see the utility beyond the styling or the function more than the form. I also really agree with Andrew on his suggested Model Y features. Here’s hoping for a Tesla Allroad wagon mash-up that might look like this. Thanks for reading this far. 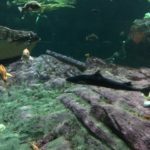 I would love to hear back from the readers. 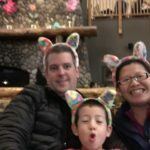 Also a big thanks to Andrew for continuing to let me guest post on the Kootenay EV Family Blog. Very reasonable travel cost for primarily DC fast/quick charging; still less than half the cost of our gas car. For the service provided, I definitely do not mind paying extra – totally worth the few extra bucks to save 2+ hours of charging at those stops! 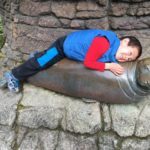 And happy to have you continuing to add content to the site – it is great to have trips from another area of BC, and another perspective on the EV movement. Cheers! Good report. 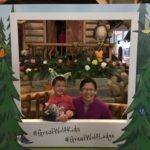 We’re down at the Great Wolf Lodge right now, having come from Victoria, through Redmond first (Anacortez ferry) to see some friends. Still no charging at the GWL but now there is a Level 2 charger at the liquor store 500m down the road which is much more reassuring. Will be heading back over Port Angeles ferry which is the sketchiest part of the trip charger wise. EVgo chargers in Seattle area are great. Charging cost so far is $4.